Walking into the museum that opened to the public Saturday in the author and illustrator’s hometown of Springfield, Massachusetts, is like walking into one of his beloved children’s books. The museum dedicated to Theodor Geisel — who under the pen name Dr. Seuss wrote and illustrated dozens of rhyming children’s books including “The Cat in the Hat” and “Green Eggs and Ham” — features interactive exhibits, artwork never before displayed publicly and explains how his childhood experiences in the city about 90 miles (145 kilometers) west of Boston shaped his work. Examples of Geisel’s early advertising work and World War II-era propaganda and political illustrations that critics consider racist are conspicuously absent, but that’s because the museum is aimed primarily at children, said Kay Simpson, president of the Springfield Museums complex. The organization has in the past hosted exhibits of Geisel’s wartime work, she said. “This museum is about visitors encountering the creatures that sprang out from Ted Geisel’s imagination — Horton, the Cat in the Hat, the Lorax, Sam I Am — that got kids excited about reading, which was really his preoccupation later on in his career,” Simpson said. Visitors are taken through Geisel’s boyhood bedroom, his grandparents’ bakery and brewery and different rooms painted in brilliant blues and radiant reds, and decorated in almost fanatical detail with scenes from the books. The museum’s second floor has a more intimate feeling with the actual furnishings and assorted knick-knacks from Geisel’s studio from the La Jolla, California, home where he lived until his death in 1991 at age 87. Even his collection of 117 bowties is on display. But by not referencing Geisel’s wartime work, which often stereotyped the Japanese, the museum is telling only half the story, said Katie Ishizuka, who has written on Geisel’s work. “They don’t acknowledge the full picture of him or they try to minimize that or sweep it under the rug,” said Ishizuka, director of The Conscious Kid Library, which lends what she says are more diverse and appropriate books for young readers. Even in his children’s books, characters of color are subservient or secondary to the white characters, or depicted as stereotypes and caricatures, she said. Dimond never heard a prejudiced word out of Geisel, she said, and knows he had some regrets about the wartime work. Richard Minear, a professor emeritus of Japanese history at the University of Massachusetts, who wrote “Dr. Seuss Goes to War” about his political illustrations, says Geisel certainly had a blind spot on race, but it’s not fair to judge his entire career on that work. “He matured and he developed a whole lot from those early years,” Minear said, noting that “Horton Hears a Who!” was an allegory about post-war Japan and the nation’s relationship with the U.S. The museum is expected to draw about 100,000 visitors annually and along with a $1 billion casino scheduled to open in 2018, is part of the Springfield’s economic renaissance, Mayor Domenic Sarno said. Geisel belongs in his hometown, the mayor said. 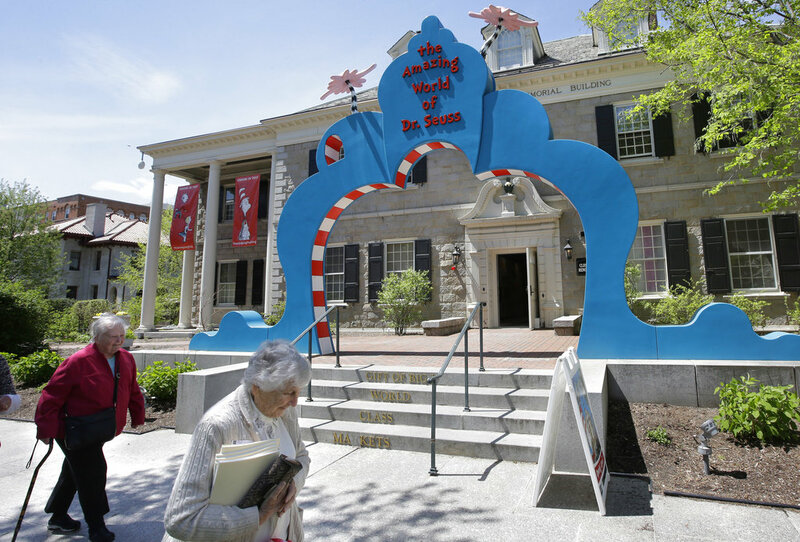 “Any other city in the country would be salivating to have a museum for a world-renowned author like Dr. Seuss,” he said. Tags: Dr.Suess, Mesuseum. Bookmark the permalink.